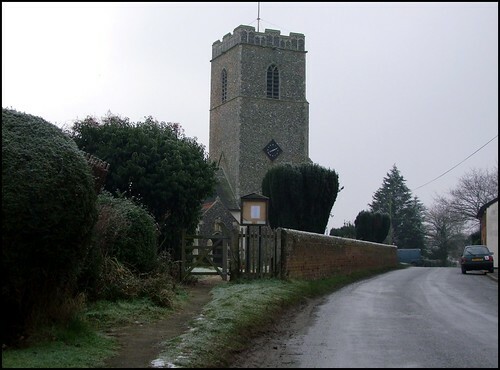 I once got into terrible trouble for something I'd written in an article about Great Glemham church, and it was nothing to do with the church or with Great Glemham. On the occasion that I'd visited, I'd reached the village from Marlesford, across the open Suffolk plain. The ditchless fields encroached on the road, and a wide concrete expanse confirmed that I was crossing a former WWII American air base, of which of course there are many in East Anglia. The former control tower at Marlesford is now a museum, and I mused then that this wasn't just an interesting historical survival, but that It is also a moving reminder of the special connection between Suffolk and the States. Many of the users of this site are American, and many Suffolkers have become Americans, from the early 17th century Puritans from the Polstead and Boxford area, to the G.I. brides of the 1940s. A particularly fine book which remembers this latter time is A Suffolk Summer by John Appleby, still in print after more than half a century. It records the Suffolk explorations of a young American airman in the summer after the war, and gives a sense of the drama leading up to the 1945 general election, which Labour won. The royalties from the book paid for the upkeep of a rose garden at Bury Abbey. At the time I was writing, George W Bush had just been installed in the White House for the very first time. Like most people outside of the States, I knew very litte about him, but I observed that, on occasions like this when the world turns to watch, many older Suffolk memories are stirred. What perhaps I shouldn't have said was that I always felt safer with a Democrat in the White House, as I was sure many Europeans did. In those early weeks of 2001, it was easy to say that we always imagined a Southern Republican sitting in the Oval Office at night, sweating slightly, the Old Testament open on his lap as his hand hovers over the button. At least with the Democrats, I said, you know the president's probably busy in the domestic wing, sleeping with his secretary. Well, as you might guess, there haven't been many topics on which I have received so many e-mails in such a short space of time - although, curiously, within eighteen months or so, they'd all dried up. Be that as it may, I soon arrived at the pretty village of Great Glemham, which has the advantage over its non-identical twin, Little Glemham, of not being bisected by the A12. On that day the sun was shining furiously, but I came back to Great Glemham from Cransford in the opposite direction on one of the coldest days in the winter of 2009, when the temperature was hovering around minus three, and a delicious hoar frost created a lace tracery on the bare trees and tussocky graveyard. Coincidentally, it was a couple of days before President Obama was sworn into office, but on that subject I will, of course, say nothing. I have learned my lesson. Although All Saints has been heavily restored in just about every department in the last 150 years, it is still essentially a small 14th century church, with a slightly earlier chancel. You enter through the north porch, where there is a rather good holy water stoup, which may or may not have been there originally. All Saints is another church which belies the old saw that the north side of a graveyard was unconsecrated ground, since virtually all the burials here are on that side. Your first sight on entering All Saints is its tremndous tremendous treasure. This is one of Suffolk's thirteen Seven Sacrament fonts, one of the best of its kind. Three of them, at Blythburgh, Southwold and Wenhaston, have been completely defaced. Of the other ten, this one, Denston and Woodbridge all have rayed backgrounds, and probably came from the same workshop. One of the remaining seven, at Badingham, shows a feature in common with the one here at Great Glemham, which I, for one, find fascinating. (The other six are at Melton, Monk Soham, Laxfield, Cratfield, Westhall and Weston, in case you're counting). The fonts show the seven sacraments of the Catholic Church, and are a reminder that our medieval parish churches were built as Catholic churches, not as Anglican ones. The sacraments are Baptism, Confirmation, Matrimony, Ordination, Reconciliation (also called Confession, or Penance), Last Rites (also called Extreme Unction, or Sacrament of the Sick) and the Eucharist. Each sacrament is shown on one panel, with the eighth panel featuring something else, usually the Baptism of Christ, but in this case the Crucifixion. The fascinating detail that this font shares with the one at Badingham, and a couple of others, is that the holy oils used in Confirmation and Ordination are contained in a chrismatory, which is carried by an acolyte. This font also shows many other insights into medieval pracice. Nowadays, the Anglican rites don't include oil or a chrism cloth, but they survive in the Catholic Church. Also, in the Eucharist scene, a houseling cloth is held by the communicants to prevent the host being scattered. Great Glemham's font may not be as awesome as Westhall's or as characterful as Badingham's, but in terms of quality and survival, it is probably the best single surviving example in all Suffolk. And the font has yet another remarkable feature. In one of the niches in the font's stem you will see, not a simple Marian lily as in the other three, but a lily crucifix. This symbol outraged the reformers of the 16th and 17th centuries, and only one other positively identified example survives in Suffolk, at Long Melford. Colour remains on the font, especially on the lilies. You'll also find it on the contemprary decorative entrance to the rood loft stair, where the fleurons decorate the arch. What a beautiful place this must have been 500 years ago! None of the rood apparatus survives at all, but one gets just a hint, here, of the sheer drama of the medieval liturgy and life of this place. The rest of the inside is homely, if not perhaps terribly exciting. There was a fairly rigorous sequence of 19th century restorations here. One of them was by J.P. St Aubyn, who did very little work in Suffolk, but he didn't leave examples of his unorthodox flair here, which on this occasion is probably just as well; he left in place the wooden chancel arch (itself restored by the great Henry Ringham a few years earlier) which is rather lovely. The interior of All Saints is dignified by some very good early 20th Century glass, the best of which is in the east window. It depicts the Risen Christ flanked by St Michael and St Gabriel, and is, I think, by Powell & Son. Also up in the chancel, in the south and north windows are three interesting medieval survivals. The Instruments of the Passion and the Chalice and Host are set in shields, and look as if they are 14th Century, while a curiosity is a roundel which appears to depict a cage, but which may be the grid-iron of St Lawrence, which is later, and may be continental. Also of interest is the village's former Methodist Sunday School banner at the west end. This is a church you'll want to come back to. Perhaps it has less of the high drama of some of the other Seven Sacrament font churches, but there is a precious jewel nestling here, a touchstone to the past.